Goatwhore. Photo credit: Earsplit Compound. Ben Falgoust, II. is the vocalist, Sammy Duet is the guitarist and vocalist, Zack Simmons is the drummer and James Harvey is the bassist of Goatwhore. They will be headlining the tour and will be supporting their full-length album, “Constricting Rage of the Merciless”. The tour will take them to 24 cities and tickets are available to purchase now. 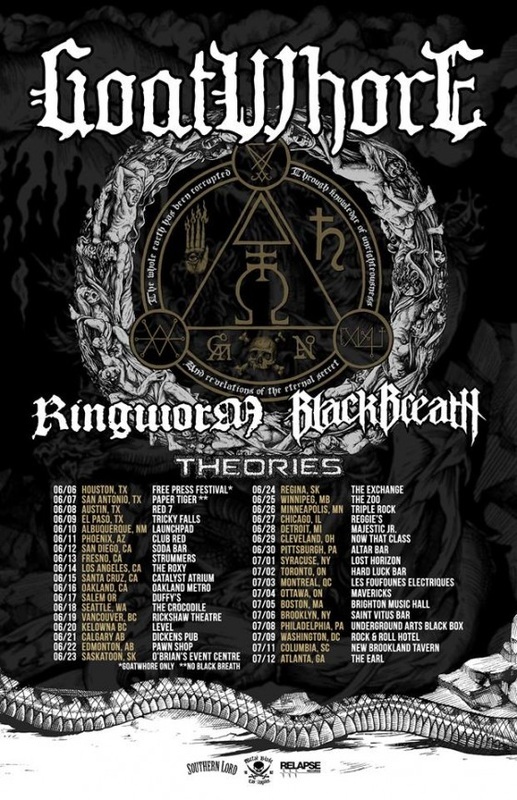 On certain dates across North America—they will be accompanied by Ringworm, Black Breath and Theories. Last month—they had a successful tour, when they toured Australia. Goatwhore was formed in 1997. They started with one demo, “Serenades To The Tides Of Blood” and followed with the albums: “The Eclipse Of Ages Into Black”, “Funeral Dirge For The Rotting Sun”, “A Haunting Curse”, “Carving Out The Eyes Of God” and “Blood For The Master”. “Constricting Rage of the Merciless” was released on July 8, 2014 and in Europe on July 7, 2014 via Metal Blade Records. It debuted at number 81, on the Billboard Top 200 chart. It became the most successful album to date for Goatwhore. Their previous album, “Blood For The Master”, reached number 171. Other accomplishments for the ten song album, “Constricting Rage of the Merciless”, include reaching number 21 on Billboard’s Rock chart. 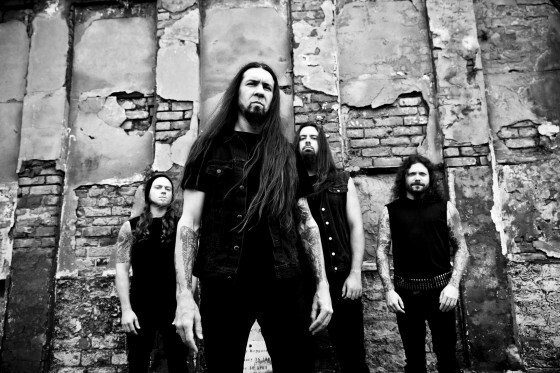 To learn more about Goatwhore, please click here. You’ll be able to listen to “FBS” and watch 13 music videos, including “Nocturnal Conjuration of the Accursed”. To “Like” them on facebook, please click here. To check them out on MySpace, please click here. To follow them on twitter, please click here. To subscribe to their YouTube channel, please click here. To purchase tickets to a concert nearby, please click here. To purchase tracks from Goatwhore’s album, “Constricting Rage of the Merciless” on iTunes or the album, please click here. To visit their North American online store, please click here. To visit their European online store, please click here. To visit their United Kingdom online store, please click here. May 8 - The Tavern, Hattiesburg, Miss. May 9 - Crowbar, Metal for the Military Show, Tampa, Fla.
May 10 - Grand Central, Miami, Fla.
June 10 - Launchpad, Albuquerque, N.M.
June 11 - Club Red, Mesa, Ariz.
June 13 - Stummer's, Fresno, Calif.
June 14 - The Roxy Theatre, West Hollywood, Calif.
June 15 - The Catalyst Atrium, Santa Cruz, Calif.
June 16 - Oakland Metro Operahouse, Oakland, Calif.
June 17 - Duffy's Hangar, Salem, Ore.
June 30 - The Lost Horizon, Syracuse, N.Y.
July 4 - Brighton Music Hall, Allston, Mass. July 5 - Saint Vitus Bar, Brooklyn, N.Y.
July 11 - New Brookland Tavern, West Columbia, S.C.